The colorful pageantry of human history in Orange County began at some undetermined point in the distant past when Shoshone Indians came to dwell along the coast and in the lower canyons of the mountains. Theirs was a simple form of existence: they lived off of the abundance of the land. In 1769, Gaspar de Portola, a military man and Spanish aristocrat, was appointed governor of Lower California. He commanded an expedition traveling northward into the literally unmapped and half mythical territory of Alta California. His assignment was to seek out the legendary Bay of Monterey. He was also to secure the Spanish claim to his vast frontier against any invasion from Russian trappers or British colonizers. Portola called upon Father Junipero Serra, president of the Mexico City Missionary College, to assist in this monumental undertaking. It was late in July in 1769 when this first party of European explorers reached the boundaries of present-day Orange County. Members of the expedition named the region "The Valley of Saint Anne" (Santa Ana). It was to this valley that Father Serra returned six years later, where he proceeded with the work of establishing the Church and converting the local people. While the East Coast of North America was engaged in revolution and spectacular change, the West Coast too was undergoing a quiet and almost undetected transformation. 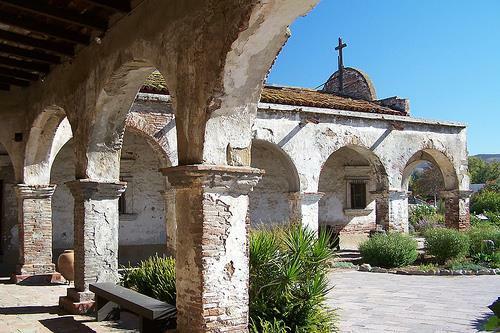 Father Serra dedicated the Mission of San Juan Capistrano, Orange County's first permanent settlement, on November 1, 1776. The Mission became a self-sustaining unit based upon an agricultural economy. Its chapel and adjoining structure were the first signs of civilization erected upon the fertile, virgin soil of the Santa Ana Region. In 1801, Jose Antonio Yorba, a volunteer in the Portola expedition, also returned to Santa Ana. He established the county's first rancho (Santiago de Santa Ana) in what are today the cities of Villa Park, Orange, Tustin, Costa Mesa and Santa Ana. Following Mexico's liberation from Spanish rule in 1821, the extensive land holdings of the Capistrano Mission were subdivided and awarded to a number of distinguished war heroes. By this time Yorba's Rancho Santiago de Santa Ana had grown to resemble a feudal manor, and the romantic rancho era of Orange County had been ushered in. Cattle were introduced into the area in 1834. A prosperous hide and tallow industry developed. Southern California became a virtual suburb of New England as sailing ships loaded with cargo traveled back and forth between coasts. In 1835, author-seaman Richard Henry Dana arrived at what is today known as Dana Point. He later immortalized Spanish Orange County in his book "Two Years Before the Mast" by describing it as "the only romantic spot on the Coast." The Spanish California tradition of a carefree lifestyle, fiestas with music and dancing, bear and bull fights, rodeos, and gracious hospitality, survived until the 1860. A severe drought brought an end to the cattle industry. Adventurous pioneers, such as James Irvine, capitalized on the economic downfall of the ranchos. Irvine, an Irish immigrant, established a 110,000-acre sheep ranch that is today one of the most valuable pieces of real estate in America. In 1887, silver was discovered in the Santa Ana Mountains. Hundreds of fortune seekers flocked to the "diggings." Land speculators and farmers came by rail from the East to settle in such boomtowns as Buena Park, Fullerton and El Toro. Orange County was formally organized as a political entity separate from the County of Los Angeles in 1889. The wilderness had finally given way to irrigated farmlands and prosperous communities. A year-round harvest of Valencia oranges, lemons, avocados, and walnuts made agriculture the single most important industry in the fledgling county. And with orange groves beginning to proliferate throughout the area (150,000 orange trees), the new county was named for the fruit: "Orange County." The twentieth century brought with it many industrious individuals such as Walter Knott, a farmer turned entrepreneur, who founded the Knott legacy in Buena Park. During the years that followed, Orange County witnessed the discovery of oil in Huntington Beach, the birth of the aerospace industry on the Irvine Ranch, and filming of several Hollywood classics in the Newport area. In 1955, Walt Disney opened his Magic Kingdom in Anaheim. Noted as the pioneer of animated films, Disney revolutionized the entertainment world again with his "theme park" recreation concept. By 1960, the neighboring metropolis of Los Angeles was "bursting at the seams." As the population spilled over the county line and across the rural Santa Ana Valley, it left in its wake an urban landscape of homes, shopping malls, and industrial parks. Today Orange County is the home of a vast number of major industries and service organizations. As an integral part of the second largest market in America, this highly diversified region has become a Mecca for talented individuals in virtually every field imaginable. Indeed the colorful pageant of human history continues to unfold here; for perhaps in no other place on earth is there an environment more conducive to innovative thinking, creativity and growth than this balmy, sun bathed valley stretching between the mountains and the sea in Orange County.